Grace Nicholson is the Clinical Sister at 132 Harley Street. Grace Joined our team in 2015 and has been qualified for over 40 years. She has experience in orthopaedics, cardiology, gynaecology, general surgery, urology, ENT and dental surgery. She has worked at the Princess Grace Hospital as a Senior Clinical Sister, running the gynae ward. And also worked at Spire Bushy out patient department. When she is not nursing she enjoys spending time with her grandchildren. 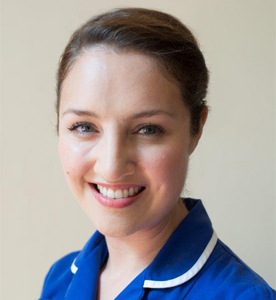 Lucy is a Staff Nurse at 132 Harley Street. She joined our team in 2014 and has been qualified since 2008. She has experience in gynaecology, sexual health, alternative medicine, dermatology, occupational health, surgical and emergency care. She also has a keen interest in health promotion with a focus on healthy eating and lifestyle choices. When she is not nursing she is involved in the arts, most notably dance, acting and drawing. Izabela Olejniczak qualified in Tourism and Hospitality in Poland and has lived in London since 2008. She is a highly experienced medical receptionist with over 5 years’ experience in working within clinical settings and is skilled in optimizing clinic workflow by managing patients, physician schedules and patient appointments. Izabela joined our team in January 2017 and is the first point of contact for patients, guests and clients delivering exceptional customer service. Her work also includes patient accounts and patient records management. In her free time, she enjoys reading, cycling and skiing. Following more than 6 years working as the Operating Theatre secretary at London Bridge Hospital, Bridget worked for a legal firm for 18 months. She then moved back into private health and was employed as Practice Manager to a private GP & then PA to consultants in various different areas of medicine including Oncology, Dermatology & Cardiology. For the last 12 years Bridget has been employed at 132 Harley Street, firstly as PA to the Managing Director and then became the Clinic Manager earlier this year. In her spare time, she enjoys Theatre, Opera, Jewellery design and has a keen interest in health and fitness.